Dandy Lions program is especially designed for children under five years old. 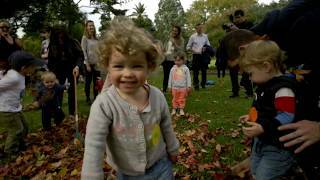 This unique and engaging program offers garden adventures for pre-schoolers and their carers. Nature-based art and craft, sensory walks, fun stories and play, and hands-on gardening activities including planting, tending and harvesting. Each week explore a new garden-related theme, with lots of hands on engaging activities that children just love, whilst socialising with new-found friends, with the Sydney Harbour as an inspiring backdrop. Use a magnifying glass; Hunt for camouflaged critters; Create a stick insect creature of their own. Sing and dance under the trees; Explore the gardens on a nature walk to collect treasures and make an autumn mobile or crown. Suitable for children up to five years of age. Includes all craft and gardening materials.